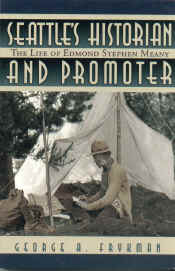 Description: Edmond Meany promoted Washington's participation in the 1893 Chicago World's Fair. He then won a seat in the state legislature and became a supporter of Seattle's first world's fair in 1909. Meany taught history for nearly four decades at the University of Washington and edited the Washington Historical Quarterly, 1906 to 1935. As teacher, editor, author, and collector of pioneer reminiscences, Meany became the state's most important and influential historian. George A. Frykman is professor emeritus of history at WSU, where he taught for 37 years.